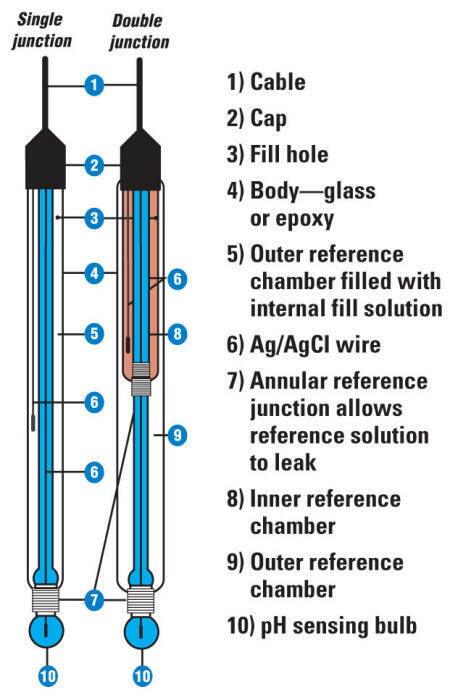 A typical pH probe is a combination electrode, which combines both the glass and reference electrodes into one body. The pH electrode is essentially a galvanic cell. The measuring part of the electrode, the glass bulb on the bottom, is coated both inside and out with a ~10nm layer of a hydrated gel. These two layers are separated by a layer of dry glass and the potential is created by the equilibrium in H+ ions across the membrane.